Is a Timeshare Investment Good or Bad? In 2015, is timeshare investment good or bad? This is the question many people considering timeshare ownership ask. Unfortunately, they tend to ask the wrong people. In some states, timeshare salespeople have actually been prohibited by law from telling prospective buyers that buying a timeshare is a wise financial decision. As part of the timeshare sales pitch, it has been common to assure the buyer that their timeshare will appreciate in value and/or can be rented out for a nice chunk of money that can offset the costs related to timeshare ownership. Even though a timeshare may be a “deeded” property, it is not exactly like purchasing a piece of real property. In fact, the Federal Trade Commission, the nation’s consumer defense firm, advises that if a timeshare salesperson tells you acquiring a timeshare is a good investment, you should be very wary. In general, there are a couple of different vacation ownership alternatives offered, the first being the traditional “timeshare” type of ownership and the second being known as the “VIP” or vacation interval plan. Is Timeshare Investment Good or Bad for Your Future? Regardless of which type of vacation ownership you choose, the only true “value” inherent in either plan is in your enjoyment of the usage. There is little to no resale value of a vacation ownership plan, and actually making a timeshare return on investment is nearly impossible. Timeshare investment value is perceived by the owner but not reflected in monetary return on investment. Timeshare return on investment in monetary terms is nil. CONCERNED YOUR TIMESHARE IS A BAD INVESTMENT?Click Here for a Free Timeshare Exit Consultation! When you buy a true “timeshare” type of vacation ownership, your name is on the deeded ownership to that unit for your entire life, for a contractually agreed upon number of years, or until you pay to have the deed transferred out of your name and into the name of someone else who will then be responsible to make all associated fee payments, etc. financing charges and interest you may have procured to make the initial purchase. Some timeshare developers will even open a credit card in your name for the sole purpose of financing your timeshare purchase. 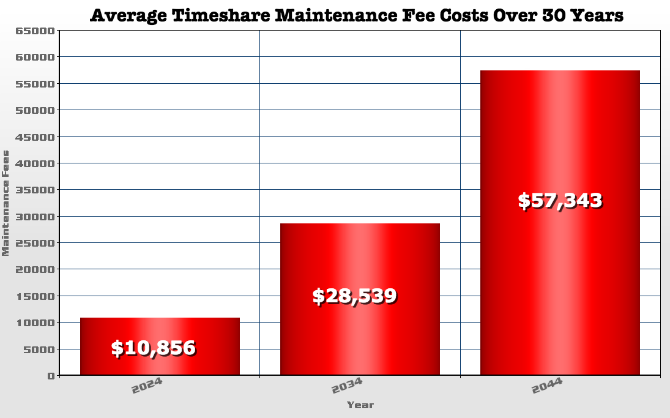 Figures and Calculations based on ARDA 2014 Timeshare Industry Survey conducted by Ernst & Young, LLP reporting average maintenance fees of $822.00 in 2014 with an average 5% increase from previous year. If you’ve bought what’s known as a vacation interval plan, you likely only own the “right to use” an interval of time at the resort for a number of years as specified in the contract. Most likely the cost of that right to use the unit will be accompanied by yearly maintenance fees, which go up about 5% each year on average. Factors influencing your satisfaction with your timeshare or vacation ownership are many, including perhaps most importantly the availability of usage. Several common time options offered by different timeshare developments include the fixed or floating time options, as well as fractional ownership, as well as biennial ownership. In a biennial ownership plan, owners are only allowed to use the unit every other year. What Determines Timeshare Investment Value? The timeshare industry’s official organization, ARDA (American Resort Development Association) announced that upwards of 7,900 NEW timeshare units are being built in 2014. This is a far greater number than the 1,900 new units that were projected to be built this year back in 2013. The FTC has advised that due to the huge number of timeshares and vacation interval plans now available, resale value is highly likely to be far lower than the price paid by the original purchaser. Should you find yourself lured into a timeshare sales presentation disguised as a “timeshare investment conference,” don’t be persuaded to make a rash decision that could cost you thousands of dollars and years of frustration. Take the time to fully calculate the costs of that timeshare over your lifetime and compare it to the cost of arranging your own vacations. Numbers that will be thrown at you during a timeshare sales presentation will be skewed in favor of you signing on the dotted line. Too Late for Timeshare Investment Research? Get Out of Your Timeshare Contract NOW! If it is too late for your to do the research and you’re looking for a way out of your timeshare contract, contact us today for a free timeshare cancellation consultation and find out what your options are to get out from under a timeshare poor investment decision that will otherwise drain you financially throughout your life.